UPDATE: The Daily Meal selected my recipe as the winner of the Perdue "Farm to Family Meals" contest! Yippee! As a health coach, I often work with clients on making sure they've got healthy foods prepared. Because, despite good intentions, if you don't have easy access to good foods, you probably won't eat good foods! Things like cooked brown rice, roasted veggies, washed greens, and grilled chicken breasts are all super versatile (quick salads, sandwiches, soups) so they come in handy in a pinch. When I was invited through The Daily Meal's Culinary Content Network to participate in the @PerdueChicken "Farm to Family Meals" contest, I was ready to use one of my simple, tasty, and nutritious meal ideas. I selected the Simply Smart Original Grilled Chicken Strips; they are fully cooked and frozen, plus no antibiotics are ever used. I used this $1.50 off coupon; every time someone redeems it, Perdue donates a meal to the hungry through Feeding America. Bonus! 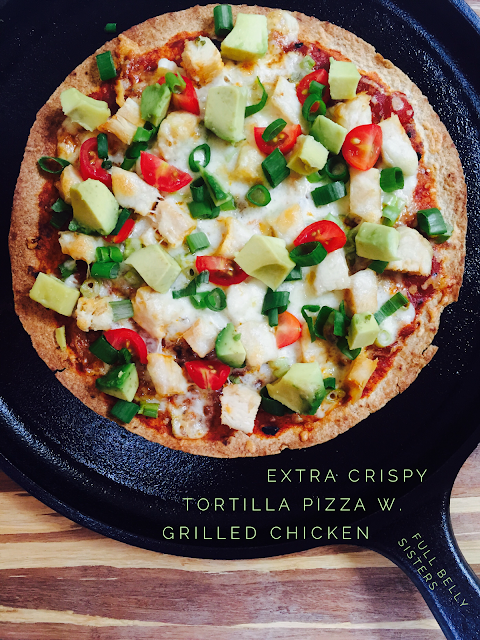 Whether you've already got grilled chicken made or you're reaching for some frozen grilled chicken strips, you've got to make this super crispy, super simple tortilla pizza! Set a 12" cast iron skillet with a little bit of oil or ghee over medium high heat on the stove. Brown both sides of your tortilla to your liking. Take it out of the pan and let it rest on a rack, if you have one, or on a plate. You will notice the tortilla gets quite firm and crisp as it cools (like bacon!). Toss the chicken into the skillet for a few minutes—the time will depend on whether your chicken is frozen or not—to warm it through. Once the chicken is warmed, cut it into bite-sized pieces. Now, to assemble the pizza. Put the tortilla back into the cast iron skillet; this pan will help ensure the tortilla stays crispy! Spread the salsa onto the tortilla; top with the grilled chicken and the whites of the scallion; then sprinkle the cheese across the top. Put the pan into the oven for 11-13 minutes, until the cheese is bubbling and beginning to brown. Remove from oven let the pizza cool in the pan for a couple of minutes. Slide onto a cutting board. Top with chopped scallion greens, tomatoes, and avocado. Then cut into sections and dig in immediately, while the pizza is still super crispy and hot. You can see here how that crust is curled up and firm, supporting all those toppings. Soggy crust is not welcome in my house. A fun way to get veggies into your kids' bellies, am I right? Your kids can even help make this simple dish, spreading the salsa, sprinkling the cheese and other toppinds—talk about a simple weeknight supper! What are your favorite easy meals to make with grilled chicken? Happy Birthday. This looks like a celebration on a plate to me! "Celebration on a plate" - i love that! I love this, and this would be a perfect meal for me when husband is away! Such a pretty meal! And happy Birthday! Happy Birthday and this pizza look fantastic! This just looks like perfection on a plate! Yum! I love that you added avocado to it as well! I am a total sucker for pizza! I could devour the whole thing! Delicious pizza idea! Healthy too. Great dinner! I just had to come back and take a second look at this one. Plus I CT on all the links. Looks just as amazing. YUM! This will be great for Monday Football, pinned!! I love a thin crispy crust pizza so this is perfect for me. Must try this. You already know how much I love this and we will be making them this week, on the menu!! 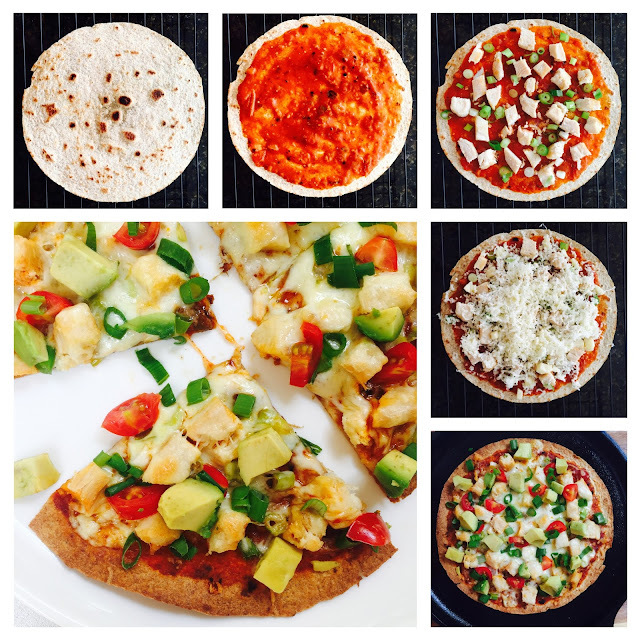 I love this absolutely easy to put together tortilla pizza. Yes it is definitely a great way to make kids eat their veggies and also involving them to prepare one will be great fun! I love anything with avocado! This looks like the perfect lunch idea for me - so yum! 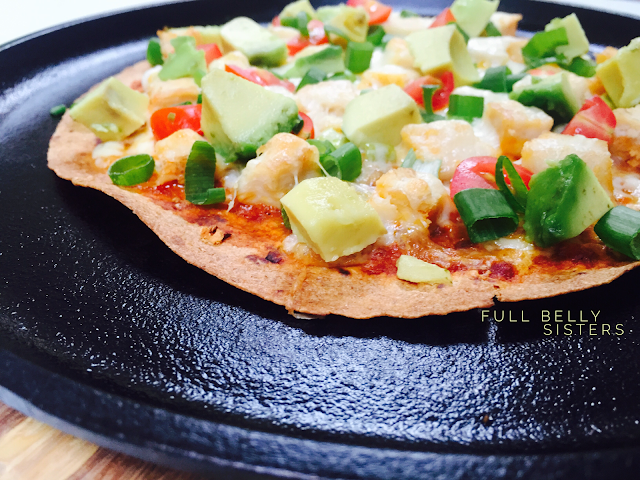 You can use cor tortillas to make this gluten free as well :-) Looks wonderful. Love the thin crust. Perfect pizza! This looks easy to make and SO delicious! I can't wait to try this! What a wonderful tortilla! Sonds delicious and super easy, I need to try soon! This is a great after school snack for my kids. 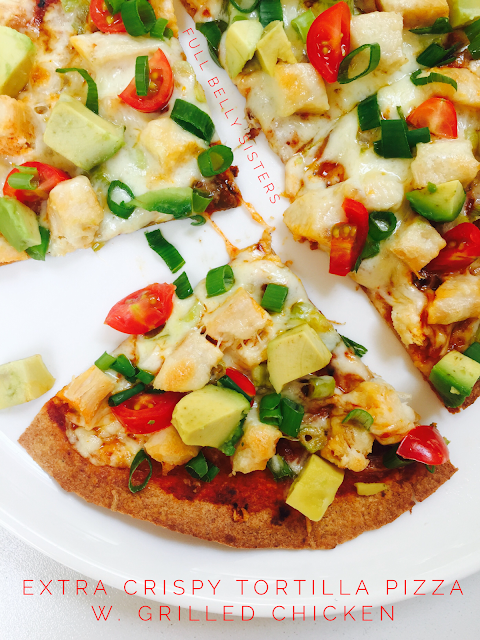 What a wonderful pizza - it's quick, nutritious and it looks so tasty! Love how you have used the tortilla and all the fresh, healthy ingredients! I am very excited to try this! My 5 yo son will love choosing and sprinkling his own toppings. Do you have any special tricks for making more than one at a time - does it work on a pizza stone or baking sheet? This would be a great weeknight meal for my family. As long as you brown the tortilla on the stovetop and let it cool and crisp up before adding topping it should stay crispy. I would crisp up as many tortillas as you need on the stovetop, then add the toppings and bake them on a pizza stone or on a rack over a baking sheet. These will help them stay super crispy. If you have to put them just on a baking sheet, the stovetop crisping should prevent them from getting soggy, but they might not be quite as crisp as in cast iron/rack/pizza stone. Let us know how you and your son like them! Easy to make, yummy and fun...everybody wins! Thanks for sharing this fantastic recipe with us! Yum I am pretty sure this is happening for lunch! We made these and I had to come back to tell you how much we loved them!! We will be making them again soon! Mmmmm, loving this easy meal idea! What a fantastic pizza combo. 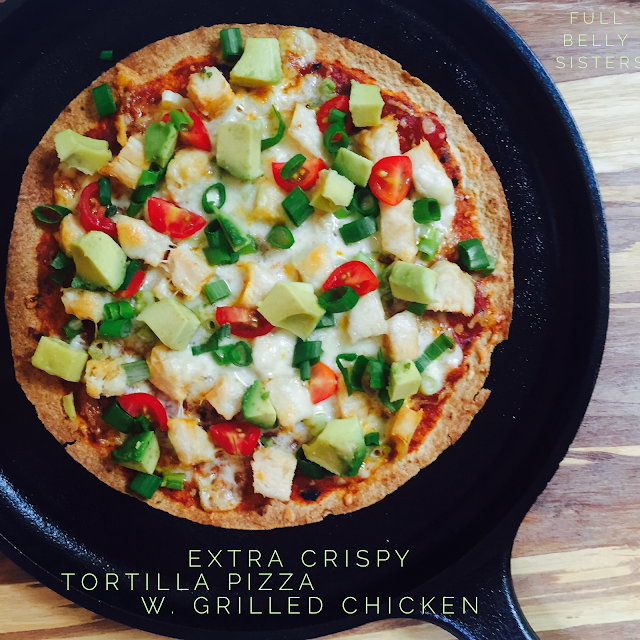 I love the idea of tortilla pizza! At first I thought it was basically a tostada, but with the added sauce and putting it in the oven, it makes it almost into an entirely different creation! I'll be doing this for a date in the near future for sure. 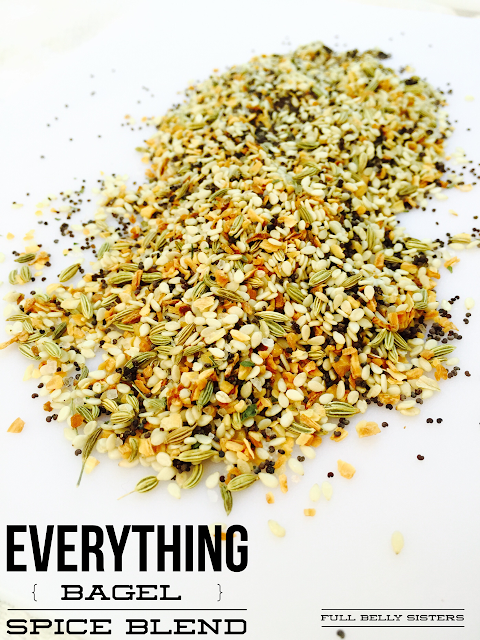 Delicious,nutritious, and easy to make... Thanks for the recipe!! Delicious,nutritious and easy to make.... Thanks for the recipe! !